07/06/13 -- Soycomplex: New crop beans posted strong gains. The July 13 was pressured by funds rolling out of nearby longs and into the deferreds. Nevertheless beans gained for the sixth week in a row, their best run in 4 years, according to Bloomberg. The trade seems to be thinking that as well as some corn acres going unplanted this year, there could also be some soybean area unsown. 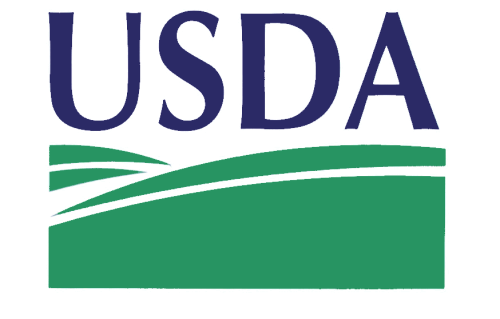 The USDA will report on planting progress for both on Monday. Trade ideas seem to be that soybean plantings may have risen from 57% complete last week to around 70% done as of Sunday night. If correct that would still leave over 23 million acres still to be sown. CNGOIC estimated China’s May bean imports at 5.6 MMT and estimated June imports at 7.0-7.5 MMT. Informa estimated the 2013/14 world soybean crop at a record 286.6 MMT, up 7.5% on this season. They have US production up 12.3% at 92.2 MMT and Argentine output at 58.0 MMT, up 16%, both would be a record. They place Brazil's crop around the same at this year at 82.7 MMT. The Buenos Aires Grains Exchange reported Argentina's 2012/13 soybean harvest at 98% complete, up from 96.1% a week ago and versus 95% this time a year ago. They estimated output at 48.5 MMT, unchanged from their previous forecast. Weekend weather developments will decide price direction on Monday, after that we could be in for some consolidation in beans following recent gains as traders may decide to bank a few profits ahead of Wednesday's June WASDE report from the USDA. After that we're back to trading the US weather again. Jul 13 Soybeans closed at USD15.28 1/4, up 1 cent; Nov 13 Soybeans closed at USD13.30 1/4, up 24 1/2 cents; Jul 13 Soybean Meal closed at USD452.50, down USD1.50; Jul 13 Soybean Oil closed at 48.53, up 37 points. For Jul 13 beans and meal this was the highest close on the weekly chart since mid-September. Jul 13 beans closed 18 1/4 cents higher for the week, with Nov 13 up 26 cents. Jul 13 meal rose USD5.30 and Jul 13 oil added 15 points on the week. Corn: Corn also rose, seeing the best gains coming in the deferred new crop months on continued heavy rains and planting delays in the Midwest. Monday night's crop progress report from the USDA is expected to show plantings at 93-95% done, up only marginally versus 91% as of last Sunday night. Weekend weather forecasts aren't friendly for much progress to me made in northern areas. "Over the next 5 days the latest GFS model has the heaviest rains falling from Central North Dakota to extreme Northern Montana and into Northwestern Illinois," say QT Weather. Consider though that even if we only end up with 95% of what was expected to be a 75-year high area get sown this year then that's still a respectable 92.4 million acres. Cut yields down to 155 bu/acre from the USDA's current 158 bu/acre and we could still end up with a record crop of almost 13.2 billion bushels allowing for a "normal" 8% abandonment rate. Informa estimated the US corn crop at 365.7 MMT, up more than 33% on last year. They have world output at a record 967 MMT, up 12.7%, with the EU crop rising 17.3% to 66.4 MMT (matching the 2004 record) and the Ukraine crop up 17.2% to a record 24.5 MMT. The Buenos Aires Grains Exchange said Argentina’s corn harvest is 61% complete, up from 54.7% a week ago and versus 64.8% a year ago at this time. They estimated production at 24.8 MMT, unchanged from last week. A consignment of 60 TMT of Argentine corn is en route to China, the trade is watching with great interest to see if it clears stringent Chinese quarantine rules OK. If it does it could be the first of many under a deal signed in February last year. It is probably not in China's best interests to reject the cargo, but that doesn't necessarily mean that they won't. The Mississippi river reopened a 5-mile stretch near St Louis, the river had been closed for 4 days due to high water. Ahead of next week's USDA report one trade survey estimated US corn production at 13.82 million bushels, versus 14.14 million last month. This season's ending stocks were forecast unchanged at 759 million bushels. The 2013/14 carryout is expected to come in at 1.830 billion bushels, down from 2.004 billion in May. Jul 13 Corn closed at USD6.66 1/4, up 3 cents; Dec 13 Corn closed at USD5.58 1/2, up 10 1/4 cents. For the week overall that puts nearby Jul 13 up 4 cents and Dec 13 down 8 3/4 cents. Wheat: Nearby wheat closed modestly lower on all three exchanges. The window is rapidly closing for spring wheat planting, supporting prices in Minneapolis. US spring wheat planting was up just one point for the week to 80% done last Monday, and well behind the 5-year average of 92%. With another wet week behind it spring wheat planting may still only be around 83% done in Monday's upcoming report. Wheat production prospects elsewhere look pretty good though. Informa pegged the world wheat crop at a record 703.5 MMT, up 2.5 MMT on the USDA's May forecast and a 7.6% increase on last year with big gains seen coming from the Black Sea. The Buenos Aires Grains Exchange's weekly crop report estimated that 19.4% of their 2013/14 wheat crop is planted versus 9% a week ago and 11.1% a year ago. They estimated the wheat area at 3.9 million hectares, unchanged from their previous estimate. The Argentine Ministry say that plantings will rise from 3.16 million hectares last year to 4.0 million in 2013/14, an increase of 26.6%. A production increase of that magnitude would add almost 3 MMT to their crop next season, based on the USDA's estimate of 11.0 MMT in 2012/13. Looking ahead to Wednesday's WASDE report, the USDA had Kansas wheat production at 768 million bushels in its May Crop Production Report, down 236 million, or 23%, from 1.004 billion in 2012. The average trade guess for next week is 757 million bushels, from within a range of 675-815 million bushels. Early yield reports from Texas and Oklahoma are highly variable. The 2012/13 US wheat marketing year is now over. The USDA will need to reduce their forecast for US exports of 28 MMT in the year that has just ended, increasing beginning stocks for 2013/14. They may also revisit their projection for US exports of 25.5 MMT in 2013/14 in the face of much stronger competition from the Black Sea in the year ahead, and also reticence from Asian buyers to US wheat following the newly emerging GMO problems. Jul 13 CBOT Wheat closed at USD6.96 1/4, down 1 1/2 cents; Jul 13 KCBT Wheat closed at USD7.35, down 3 1/2 cents; Jul 13 MGEX Wheat closed at USD8.19 3/4, down 1/2 cent. For the week that puts Chicago wheat 9 1/4 cents lower, with Kansas down 16 cents and Minneapolis a quarter of a cent easier. 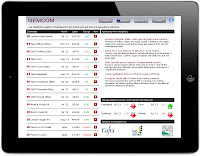 07/06/13 - EU grains closed lower with Jul 13 London wheat down GBP2.50/tonne at GBP174.00/tonne and Nov 13 down GBP0.35/tonne at GBP175.25/tonne. Paris wheat closed with front month Nov 13 EUR0.50/tonne easier at EUR203.75/tonne. For the week that pegs Jul 13 London wheat down GBP8.50/tonne, with Nov GBP3.25/tonne lower and Nov 13 Paris wheat slipping EUR2.25/tonne. This was the lowest close for a front month on London wheat for almost a year. The pound rising to a 4-month high versus the US dollar didn't help. US wheat meanwhile seems to be attempting to paddle it's own canoe, concentrating on the problems there with both winter and spring wheat. Plantings of the latter in North Dakota are the slowest since at least 1981, Bloomberg reported yesterday. Across the border things are much better though, with Saskatchewan spring wheat 83% sown, in line with 82% normally and up 26 points from a week previously. Elsewhere there is also reason for optimism regarding prospects for 2013/14. Black Sea spring grain plantings have also caught up. Ukraine is finished, Kazakhstan is all but done at 99.8% complete and Russian growers have now sown 29.6 million hectares, or 97.6% of the intended area (including a record corn area). Winter wheat planting in Argentina is underway at 19.4% complete, up from 9.0% a week ago and above the 11.1% planted this time last year. Conditions are said to be near ideal. The Ministry say that they expect to see plantings rise from 3.16 million hectares last year to 4.0 million in 2013/14, an increase of 26.6%. The Buenos Aires Grains Exchange are not far behind predicting an area of 3.9 million ha. Brazil's CONAB forecast a 2013/14 wheat crop of 5.56 MMT, up from the 5.4 MMT that they estimated previously and 27% more than last year's output of 4.37 MMT. Informa estimated the world wheat crop at a record 703.5 MMT, broadly similar to yesterday's 702 MMT from the FAO/AMIS and the USDA's 701 MMT. They have the Russian crop at 52 MMT, up 38%, with Ukraine producing 21.4 MMT, up 35%, and Europe seeing production of 138.8 MMT, up 5% on last year. Good winter rains will boost Morocco's grain crop to 9.7 MMT this year, say the Ministry, an increase of 90% on last year's drought damaged crop. Soft wheat output will rise by a similar percentage to 5.2 MMT, they added. The USDA has them down to import 39% less wheat in 2013/14. Closer to home, the German Farmers Association (DBV) said that the area of farmland affected by the recent floods there is at least 150,000 hectares, and possibly as much as 250,000 ha. To put that into perspective the German grain area for the 2013 harvest is seen at 6.5 million ha, along with a further 1.4 million going into rapeseed. That puts the cropping area flooded at a maximum of 3% even if we go with the higher estimate and assume that all the land involved was under cultivation with grains/rapeseed and not simply pasture, fruit/vegetables etc. The HGCA said that we used 505 TMT of wheat for flour, starch and/or bioethanol production in April, of which 62.5% was home grown - the lowest proportion in a single month since 1993/94. Imported wheat usage in the Jul/Apr period was 1.36 MMT, almost double that of a year previously. Apr 1 home grown wheat stocks were down 15% year-on-year, imported stocks were up 62%. The Farmers Guardian carried a report concerning the ongoing production problems at Vivergo, suggesting that the plant's wheat usage this season might be less than 100 TMT, less than a tenth of their anticipated annual requirement when fully operational. FranceAgriMer released their weekly planting progress and crop condition report today. Crop development is still lagging for the week through to Monday. They say that 56% of the winter wheat crop is heading, up from 35% last week but well behind 97% this time last year. Winter barley is now 100% headed, spring barley is only 6% versus 52% this week in 2012. French wheat crop ratings held steady for wheat at 68% good/excellent, and likewise for winter barley at 67%. Spring barley in the top two categories slipped to 73% from 78% a week ago. Corn conditions good/excellent also fell from 67% last week to 62% this time round. Corn plantings didn't move from last week at 89% complete, ten points behind last year. They've had a better week weather-wise this week, so things may have improved in next week's report. 07/06/13 -- Rapemeal prices on the continent are little changed today. Nearby positions remain tight due to flooding/season closures. A clearer picture of any possible damage to new crop rapeseed in southern Germany, Poland and the Czech Republic is needed before we can expect new crop months to show signs of cracking. 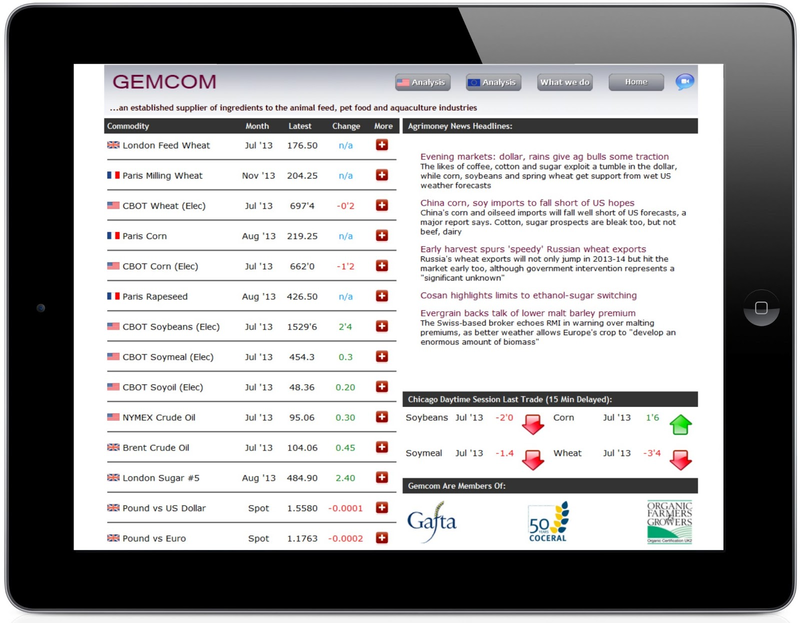 07/06/13 -- London-based feed raw material trading house Gemcom have launched an innovative new website designed to look great whether viewed on a PC, a tablet or a smartphone - one version does it all. It's absolutely perfect for keeping an eye on what's going on at a glance in the ever changing grain markets in which we operate. It's free to use, no registration required, just point your device to www.gemcom.co.uk or click their ad at the top of the blog homepage and enjoy. It's so simple to use and navigate round I reckon that even you and your fat fingers will soon get the hang of it. As well as all the usual grains there's also London sugar, Brent and NYMEX crude, forex rates, news headlines, market reports and simple charts. All designed and powered by Nogger Power! With Cereals 2013 coming up next week it's the perfect way of keeping up with the latest market developments on the move. 06/06/13 -- Soycomplex: Weekly soybean export sales of 48,400 MT of old crop and 589,900 MT of new crop were at the top end of trade expectations. The USDA's 2012/13 soybean export target has effectively been met with 99.7% on the books - the vast majority of it shipped already. Meal sales were above trade ideas at a combined 271,300 MT, and are now 102% of the USDA forecast. Whilst meal demand remains this strong the US crush will continue to be high, keeping old crop bean availability tight. Talk of Argentine meal having low protein levels this year could maintain demand for US material. There's also talk of an Argentine farmers strike coming up again soon. MDA CropCast raised their forecast for US soybean production this year to 85.16 MMT, up 13.3% on last year, due to acreage adjustments as more area is seen coming out of corn and into beans. "Rains were abundant across much of the soybean belt once again this past week, with heavy rains noted in southwestern portions of the Midwest. The rains continue to slow remaining planting, and are also resulting in some wetness and flooding. Additional rains are expected across the region this week, and should favour north central and northwestern Midwest crop areas. This will keep planting there quite slow," they said. They have the world 2013/14 crop at 265.76 MMT, up 7%. CONAB estimated the Brazilian 2012/13 soybean crop at 81.3 MMT versus a previous estimate of 81.5 MMT. They have 2012/13 bean exports estimated at 36.78 MMT, with meal exports at 14.93 MMT, both are unchanged from their previous estimates. CONAB said that in the Jan-May 2013 period Brazil has shipped 22.95 MMT of beans and 4.85 MMT of meal. Jul 13 Soybeans closed at USD15.27 1/4, down 4 3/4 cents; Nov 13 Soybeans closed at USD13.05 3/4, up 5 3/4 cents; Jul 13 Soybean Meal closed at USD454.00, down USD1.90; Jul 13 Soybean Oil closed at 48.16, down 14 points. Corn: Weekly export sales for corn were disappointing at at 107,200 MT of old crop and only 51,600 MT of new crop, versus expectations of a net 5-800 TMT combined. Old crop commitments are now 89.1% of the USDA target for the season. Despite that, corn found support from the continuing planting problems in the US and the weak dollar. "Not too much has changed in the Midwest outlook. Showers have continued this morning and there's a rainy and cool Midwest forecast for the next 5 days," said Martell Crop Projections. Yesterday's news that the weekly ethanol grind was at the strongest pace in a year was also supportive. Corn used in last week’s production is estimated at 92.9 million bushels, although that's still below the 94.82 million bushels per week required to meet this crop year’s USDA estimate of 4.6 billion bushels of demand from the ethanol sector. MDA CropCast cut their forecast for US corn production this year by 1 MMT from last week to 337.6 MMT, although that's still a 30% increase on last year. The FAO/AMIS estimated the world corn crop at a record 963 MMT, although that's 3 MMT less than the USDA it's a 10.3% increase on last year. They pegged global ending stocks at 174 MMT, far higher than the USDA's 155 MMT, and up almost 29% on 2012/13. CONAB estimated the Brazilian total corn crop at 78.5 MMT versus previous estimate of 78.0 MMT, with second crop corn performing better than originally anticipated. They said that Brazil has shipped 6.73 MMT of corn this calendar year so far (Jan/May). Brazilian total 2012/13 corn exports were estimated at 15.0 MMT, unchanged from their previous estimate. Unconfirmed rumour from yesterday says that China may have bought up to 2.5 MMT of US new crop corn in the past few days. Jul 13 Corn closed at USD6.63 1/4, up 2 1/2 cents; Dec 13 Corn closed at USD5.48 1/4, up 6 cents. Wheat: Weekly export sales for wheat were a combined 631,700 MT, slightly above trade expectations of 3-600 TMT. The report runs through to Thursday last week, which literally leaves one day of the US 2012/13 marketing year to be reported on next week. Cumulative shipments for 2012/13 stand at 26 MMT, with a further 1 MMT of sales remaining on the books unshipped. The USDA target for the season was 28 MMT, meaning that it looks like there will be around 2 MMT of extra beginning stocks to start off 2013/14. That will offset some of the anticipated 2013/14 shortfall in production. The US market is currently supported by these lower production prospects for this year. Winter wheat output is expected to be down, and spring wheat planting is way behind schedule. However, the BIG picture looks somewhat different. The FAO/AMIS today forecast a world wheat crop of a record 702 MMT in 2013/14, up 6.5% on last year, with ending stocks rising 5.5% to 173 MMT. Large production increases are expected from the usual discount sellers in the Black Sea. The USDA attaché in Moscow estimated the Russian 2013/14 grain crop at 91 MMT, up 28% on last year, with exports rising 50% to 24 MMT. Wheat production is seen at 53 MMT (+40.5%), with exports up 56% to 17 MMT. Japan bought 163,605 MT of it's usual mixture of US, Canadian and Australian wheat, but left US Western White wheat out of the equation following the recent GMO find. Jordan bought 100 TMT of optional origin wheat for September shipment at a level around USD70/tonne cheaper than current replacement levels from the US. With US wheat missing out into all but "traditional" homes once the Black Sea harvest kicks off a month from now, we could see US export sales drop off quite steeply in Q3 and Q4 of 2013. Jul 13 CBOT Wheat closed at USD6.97 3/4, down 3 3/4 cents; Jul 13 KCBT Wheat closed at USD7.38 1/2, down 4 3/4 cents; Jul 13 MGEX Wheat closed at USD8.20 1/4, up 4 1/4 cents. 06/06/13 -- EU grains closed sharply lower on an outlook for potentially record world wheat and corn production this year, despite weather concerns in the US and one or two other areas. Jul 13 London wheat finished the day GBP3.50/tonne lower at GBP176.50/tonne, and with Nov 13 ending GBP2.15/tonne down at GBP175.60/tonne. Nov 13 Paris wheat settled EUR1.75/tonne easier at EUR204.25/tonne. For London wheat this was a fresh 12-month closing low for a front month. Nov 13 Paris wheat finished within a euro of a similar milestone. They are however still significantly higher than the 2011 lows, by 26% in the case of London wheat and by 13.5% across the Channel. Rabobank forecast last week that a return close to the 2011 lows was possible in Q4 of 2013 for both Paris and Chicago wheat (CBOT wheat is currently around 16% up from the 2011 lows) without giving a prediction for London wheat. 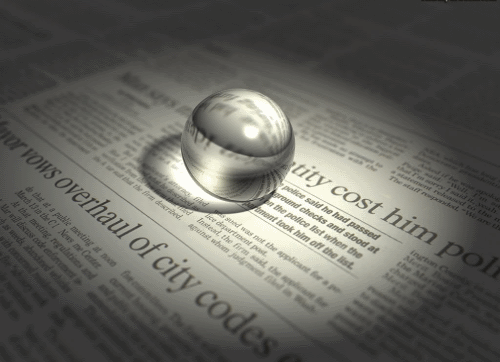 Both the Bank of England and the ECB left interest rates and QE on hold today. The pound rose to a near 4-week high against a US dollar under pressure from poor jobs data, and to a more than 2-week high versus the euro, putting particular pressure on London wheat. The Agricultural Market Information System (AMIS), a G20 initiative, forecast the 2013/14 world wheat crop at a record 702 MMT, up 6.5% on last year and fractionally higher than the USDA's May estimate. They see global corn production this year at 963 MMT, also a record if slightly lower than the USDA's 966 MMT prediction, and up 10.3% on last year. World ending stocks for wheat are seen rising 5.5% to 173 MMT and those for corn forecast up almost 29% to 174 MMT. Whilst they see the world wheat crop 6.5% higher, consumption is only forecast to increase 1.1% whilst global trade will decrease 2.5% "largely reflecting reduced purchases in Asia and Europe because of higher domestic production," they said. They didn't issue specific forecasts for individual countries. Separately MDA CropCast forecast similar production increases (albeit with lower numbers for both the 2012/13 and 2013/14 marketing years) with the world wheat crop estimated 7% higher than last year and global corn production up 11.5%, led by a 30% increase in output from the US. The USDA's FAS in Moscow released a comprehensive set of figures for Russian grain production this year. They said that "conditions for winter grains in the Southern, North Caucasian and Central Federal Districts of Russia are currently very favourable. Also (the) corn planted area is at a record level and spring sowing is progressing smoothly in European Russia (although spring wheat sowing is delayed in Siberia and the Urals)." The slow progress with spring plantings is seen trimming production slightly from the USDA's official May estimates. Even so the FAS predict a Russian grain crop of 91 MMT this year, up 28%, led by a 40.5% increase in wheat output to 53 MMT. The Russian barley crop is seen rising 21.4% this year to 17.0 MMT and the corn crop by 9.8% to 9 MMT. They also predicted a rise in wheat exports in 2013/14 of 56% to 17.0 MMT, along with increases of 52% in barley exports to 3.5 MMT and with corn shipments up 25% to 2.5 MMT. In a separate announcement the Russian government said that they intend to buy 5 MMT of domestic new crop grains to replenish state-owned stocks (they've sold 3.42 MMT of intervention grains since October). If the US do end up with a record corn crop some 30% up on last year (and apart from the USDA, AMIS, MDA CropCast, Lanworth, Informa, Rabobank and just about anyone else you care to mention are all in the same ballpark) then it's entirely possible that global demand for wheat in 2013/14 will not be as robust as current estimates suggest. Whilst the USDA currently predict a near record level of demand for wheat in the season ahead (695 MMT versus the 2011/12 record of 697 MMT) it should be considered that in 2011/12 the world corn crop was 83 MMT lower than it is projected to be this season. This afternoon's weekly export figures from the USDA suggest that US 2012/13 exports have been overestimated to the tune of 2 MMT, adding to the carry-in into the new season. It also makes the USDA target of 25.5 MMT of wheat exports in 2013/14 look ambitious. That's only 0.5 MMT less than they've managed to achieve in a season where Black Sea exports have been reduced to a trickle for six months by caps from Russia/Ukraine and in a season where all the other top ten exporting nations, bar India, are looking at significant production increases. Jordan bought 100 TMT of optional origin wheat for September shipment today at a price around USD70/tonne below the current US equivalent. Sales of 48,400 MT of old crop and 589,900 MT of new crop were in line with trade expectations of a combined 3-700 TMT. Exports were 122,700 MT. Exports plus outstanding sales now total 36.62 MMT, or 99.7% of the USDA target for the season. Meal sales were robust again incidentally at 134,200 MT of old crop and 137,100 MT of new crop. Corn sales came in at 107,200 MT of old crop and only 51,600 MT of new crop versus expectations of a net 5-800 TMT combined. Shipments this week were 359,800 MT. Exports plus outstanding sales are 89.1% of the USDA target for the season. Sales were negative 33,200 MT on old crop and 664,900 MT for new crop giving a combined total of 631,700 MT versus expectations of 3-600 TMT. Exports last week through to Thursday were 528,500 MT. Net exports for the 2012/13 season are 26 MMT with a further 1 MMT of outstanding sales unshipped. The USDA target for 2012/13 (which finished on Friday) was 28.0 MMT, leaving around 2 MMT of extra stocks to be carried into 2013/14. 06/06/13 -- Rapemeal prices on the continent today are little changed, with new crop a euro or so easier. MDA CropCast forecast the world OSR crop unchanged from last week at 59.0 MMT, up 5.5% on last year, with the Europena crop up 5.2% at 19 MMT. Wheat: Is Anyone Else Getting Deja Vu? 06/06/13 -- The overnight Globex grains are mostly lower, with beans down 7-8 cents on old crop and flat to 2 cents easier on new crop. Wheat is mostly 1-2 cents weaker as is corn. Wheat is holding up surprisingly well under the circumstances, with the harvest underway in the US and only a month off in the Black Sea region. Whilst the US wheat crop is going to be down in 2013 due to adverse weather conditions for winter wheat development and for spring wheat planting, that isn't the case everywhere else, and it's important of course to see where this wheat might be. Using the USDA's latest estimates, out of the top ten exporting nations in 2013/14 only the US and India aren't looking at higher production this year versus last year. US wheat production is forecast down 5.8 MMT this year, with new arrival in the wheat exporting Premier League, India, facing a modest 2.9 MMT lower wheat crop this year (their 24 MMT carryover stocks from 2012/13 are so large that this is a drop in the ocean anyway). That equates to 8.7 MMT less wheat from these two (bear in mind here that America's carryover stocks from 2012/13 are currently forecast at a not insignificant 20 MMT also). In second place behind the US we have Canada, after a delayed start to planting their crop is now said to be largely developing quite well. Production seen at a record 29 MMT, up 1.8 MMT on last year, primarily due to a sharp increase in plantings. In third we have perennial dark horses Russia, a rebound in yields from last season's disaster has their crop projected 18.3 MMT higher this year. Fourth place in the wheat exporting Premier League is tied between us, Europe, and our ex convict cousins Down Under. Whilst EU wheat crops this year are a mixed bag, production overall is seen 6.8 MMT higher this season, recovering somewhat from last season's poor performance. Rains appear to have arrived just in time for Australian wheat to get off to a decent start, so the USDA's forecast of a crop of 24.5 MMT looks achievable (Lanworth said 24.8 MMT yesterday and ABARES currently say 24.9 MMT), up 2.5 MMT on last year. The world's sixth top exporter in 2013/14 is expected to be Ukraine, where crops also look pretty decent by all accounts, who are set to weigh in with a crop of 22 MMT, according to the USDA, some 6.3 MMT more than a year ago. In seventh slot is India, we've covered them already. Eighth is Kazakhstan, who are expecting a crop of 15 MMT this year, up 5.2 MMT on 2012. Ninth is Argentina, with production of 13 MMT, up 2 MMT, and tenth is Turkey - they've had decent rains across the winter (Laurie White will tell you that, he was there a month or so back and it pissed it down every day, didn't it Laurie??!!) and are expecting a crop of 17.6 MMT, up 2.1 MMT versus 2012. If you dig your calculator out you will find that these other eight top exporting nations have an extra 45 MMT of wheat between them to market in 2013/14, which is a darn sight more than America and India's 8.7 MMT less - and both these two countries have large carryover stocks from 2012/13 anyway. Incidentally, when we get this afternoon's USDA weekly export data from the US we will know exactly what volume of outstanding 2012/13 US wheat sales never got shipped, thereby increasing the carryin to 2013/14 even higher than the USDA's current 20 MMT estimate. Most crucially of all Russia, Ukraine and Kazakhstan are all facing sharply higher wheat production this year, just as they did in 2011/12 following the infamous drought year of 2010. You may recall that London wheat shat it's pants to the tune of capitulating to GBP140/tonne and Paris wheat to EUR180/tonne in Q4 of 2011 as this little trio (Primark, Matalan and TKMaxx as I call them) urinated all over the market, running around mopping up any order that was going. And that was in the days back when Egypt was in the market every week too. 05/06/13 -- Soycomplex: The soybean market closed mixed with old crop a little firmer and new crop down sharply. Lanworth trimmed their estimate for US soybean production this year from 3.43 billion bushels to 3.4 billion bushels, down slightly but still a record crop. Speculation that 3-4 million acres of intended corn acres will go unplanted this spring (there were 8.75 million unsown as of Sunday night) suggests that maybe the 2013 US soybean area might be 2 million acres or so higher than the current USDA forecast of 77.1 million. Even if yields are lower than the USDA's current 44.5 bu/acre then we could still easily end up with a record US soybean crop this autumn. Old crop remains supported by tight soybean availability and high crushing levels due to strong demand for meal. A report on Reuters suggests that Argentine farmers strategy of planting GM soy on GM soy, with little in the way of crop rotation in an attempt to maximise yields is resulting in lower protein levels in beans, and thus in Argentine meal. The theory is that this is keeping demand for US meal high. Lanworth pegged the world soybean crop in 2013/14 at 286 MMT, unchanged from their previous estimate and a record high. Trade estimates for tomorrow's weekly export sales report for beans are 300-700 TMT. Jul 13 Soybeans closed at USD15.32, up 3 1/4 cents; Nov 13 Soybeans closed at USD13.00, down 16 cents; Jul 13 Soybean Meal closed at USD455.90, up USD3.40; Jul 13 Soybean Oil closed at 48.30, down 29 points. Corn: The corn market also saw a widening of the differential between old and new crop. Lanworth also cut their forecast for 2013 US corn production, but again only slightly, from 13.9 billion bushels to 13.8 billion. This would still comfortably be a record output. They cut their world 2013/14 production forecast by 4 MMT to 961 MMT, but also still easily a record and 12% up on last year. Weekly ethanol production data was supportive for old crop at 882,000 barrels/day, the largest daily corn use since June 2012 and up 19,000 bpd on last week's 863,000 bpd. Ethanol imports were zero. Informa estimated the Argentine corn crop at 25.5 MMT, which is 1 MMT below the USDA. They estimated the Brazilian corn crop at 78.5 MMT, which is 2.5 MMT more than the current USDA forecast. Iran bought 60,000 MT of Black Sea origin corn for June shipment. APK Inform said that Ukraine farmers had planted a record grain area for 2013, including an all time high corn area of 4.7 million hectares. Cool and wet weather continues to dog US corn planting. "Maximum temperatures last week were 4-5 F below normal in Minnesota and the northern Midwest at large. Slight warming is predicted on the weekend maximum temperatures recovering to low 70s F. There also would be a renewed risk of showers in Minnesota, South Dakota, Wisconsin and Nebraska with expected rainfall from 0.25 – 1 inch expected," said Martell Crop Projections. Trade estimates for tomorrow's weekly export sales report are 500-800 TMT. Jul 13 Corn closed at USD6.60 3/4, up 1/4 cent; Dec 13 Corn closed at USD5.42 1/4, down 10 3/4 cents. Wheat: Informa reduced their US winter wheat production estimate from 1.529 billion bushels to 1.494 billion, but still a little higher than the USDA predicted last month. They predicted a HRW wheat crop of 778 million bushels (the USDA go 768 million), SRW wheat at 505 million (USDA: 501 million) and soft white wheat at 211 million. Lanworth left their 2013/14 world wheat production forecast unchanged at 694 MMT, just 3 MMT shy of the 2011/12 record output. They raised their Australian production estimate to 24.8 MMT (versus 24.5 MMT from the USDA) but cut their Canadian forecast to 27.9 MMT (vs. 29.0 MMT from the USDA). South Korea said that they'd found no traces of GMO wheat in any shipments from the US, but millers there said that they won't be resuming US wheat imports just yet until an explanation as to how GMO wheat was found growing in Oregon 8 years after tests on the strain were suspended. US wheat shipments that have already arrived in South Korea are facing delays of up to 3 days to begin to unload whilst the appropriate tests are carried out. South Korea bought 60 TMT of optional origin, possibly from the Black Sea, feed wheat for October shipment from Toepfer. Algeria bought 425 TMT of possibly French wheat for November shipment. Winter wheat harvesting is underway in Texas and Oklahoma, reports suggest that yields are down and protein levels are up on heat during heading. Trade estimates for tomorrow's weekly export sales report are 300-600 TMT. Jul 13 CBOT Wheat closed at USD7.01 1/2, down 7 1/2 cents; Jul 13 KCBT Wheat closed at USD7.43 1/4, down 7 1/2 cents; Jul 13 MGEX Wheat closed at USD8.16, down 5 cents. 05/06/13 -- EU grains closed lower with Jul 13 London wheat finishing the day GBP2.00tonne easier at GBP180.00/tonne and Nov 13 ending GBP1.25/tonne weaker at GBP177.75/tonne. Nov 13 Paris wheat settled EUR1.50/tonne down at EUR206.00/tonne. The market needs help and encouragement to move higher, but without it lower is the path of least resistance. With every day that passes the Black Sea harvest gets closer, and despite some market concerns over production there, output is definitely going to be higher - it's just a case of by how much. The Russian Ag Ministry today estimated the 2013 wheat crop at 54-55 MMT, up around 42-44% on last year, even if slightly below the USDA's forecast of 56 MMT. Total grain exports were pegged at 18-20 MMT in 2013/14, around 30% higher than this season. There will not be any export restrictions in 2013/14, they added. APK Inform estimated the Ukraine 2013/14 grains/pulse area at a record 16 million ha, including 6.8 million ha of wheat (versus a USDA estimate of 6.6m), 4.7 million ha of corn (similar to the USDA's figure) and 3.3 million ha of barley (versus 3.2m from the USDA). The USDA have wheat production in Ukraine up 40% this year even with a lower acreage number. Kazakhstan's wheat crop is also seen sharply higher in 2013, up more than 50% according to the USDA. Elsewhere amongst the major exporting nations Lanworth Inc today pegged the Australian wheat crop in 2013/14 at 24.8 MMT, up 13%, following the recent arrival of timely rains. They also estimated the Canadian wheat crop at 27.9 MMT, an increase of a more modest 3% on last year. The EU Commission yesterday estimated the EU soft wheat crop at 127.9 MMT, up 3.3% versus 2012. The Argentine wheat crop is forecast at 13.0 MMT in 2013/14, up 18% on last year by the USDA - the Argentine government estimate plantings up by almost 40% without giving a production estimate as yet. Meanwhile the Turkish crop is seen up more than 9% to 21.9 MMT. Apart from the US and India these are the top seven wheat exporting nations in the world. Algeria were said to have bought 425 TMT of wheat for Nov shipment in a tender today, some if not all of that may have been French origin. The trade is waiting on news from France with regards to Egypt's official request for assistance in buying French wheat. Egypt accounted for only 3% of French soft wheat exports in 2011/12 so they may not see them quite as such a strategic partner as Egypt would like. Russia sold just under 36,500 MT of intervention grain in a tender today. The volume of government stocks sold so far since sales began last October is now in excess of 3.43 MMT. There's some talk that the Russia government will begin buying grain to replenish their depleted state-owned stocks as early as the beginning of July. At home an estimated 140,000 ha of spring barley was drilled in the UK in May, almost four times the normal area drilled late, say the HGCA/ADAS. 05/06/13 -- Rapemeal prices on the continent are up nearby as flooding on the Rhine, Elbe and Danube disrupts barge movements. New crop sees little change. The 2013 rapeseed harvest in Eastern Europe is expected to be underway within a couple of weeks. 05/06/13 -- The overnight Globex grains are mixed. Wheat trades flat to 2-3 cents easier, old crop corn is a cent higher and new crop 4-5 cents weaker, soybeans are 3 cents higher to 3 cents lower. The dollar is weak in ideas that a tightening of US fiscal policy may not be too far away. The Bank of England's Monetary Policy Committee starts its two-day meeting today, last month's vote was split 6-3 against increasing QE. A survey by a US analysis group, Roach Ag Marketing, apparently estimated that 3.7 million acres of US corn will go unplanted this year. That would bring plantings down to 93.6 million, close to Morgan Stanley's recent estimate of 93.5 million. The latter still projected record US corn production this year however. Michael Cordonnier yesterday said that 1.5-3.0 million acres of corn might not get planted in the US this year, and that around half of that would go into soybeans. If Roach are correct then that potentially means an extra 1.85 million acres of soybeans in the US this year, taking the planted area up to just under 79 million acres. The USDA already predict a record US soybean crop this year, and they may be using an acreage figure almost 2 million too low then it would seem. Egypt have asked France to cut them some slack on wheat sales. Well, a lot of slack actually. As I understand it what was formerly the world's largest wheat buyer would like is "assistance in building grain silos in Egypt" - I assume this "assistance" means we provide the land, you pay for everything. Possession is 9/10ths of the law they say, and that's not even in Egyptian law. I'm sure France can have their investment money back if they ask for it nicely though. Point two seems to be "you store wheat that we've bought in France for up to six months for nothing and bring it to us when we ask for it" - stick a broom up my French arse and I'll sweep the floor for you then. Point three is "we pay for it 9-12 months after we've had it" - insert the word "possibly" in there. This is all starting to sound a wee bit one-sided isn't it? Still, this is the French we are dealing with, so they might just go for it. It wasn't that long ago that Egypt virtually barred French wheat from coming in by insisting on minimum 60 TMT cargoes with only one port of loading as you may recall. Egypt accounted for only 3% of French soft wheat exports in 2011/12 after this new rule was introduced, and now all of sudden they want to be mates again. I know what my response to their request would be. APK Inform say that Ukraine's 2013 grains/pulse area will be a record 16 million ha, including 6.8 million of wheat. That's 0.2 million more than the USDA currently predict. The Ukraine analysts say that the corn area this year will be 4.7 million ha (the same as the USDA) and that barley plantings will be 3.3 million (versus 3.2 million from the USDA). South Korea say that they've found no trace yet of GMO wheat in imports from the US. Russia's Deputy Ag Minister forecasts grain exports in 2012/13 at 15.4-15.5 MMT, rising to 18-20 MMT in 2013/14. Hot and dry weather in May sees maturity of the rapeseed crop in eastern Europe 8-10 days ahead of normal. Harvesting in Bulgaria, Moldova and southern regions of Romania and Ukraine is expected to begin within a fortnight. Old crop carryover stocks in Bulgaria are already said to be running at an all time high. At home an estimated 140,000 ha of spring barley was drilled in May, almost four times the normal area drilled late, say the HGCA/ADAS. 04/06/13 -- Soycomplex: Last night's crop report showed 57% of the crop was planted, in line with market estimates and up from 44% last week. The crop was 93% planted at this point last year. The 5-year average for this time of year is 74% and the 10-year average is 79%. The unplanted area is the equivalent of around 33 million acres. Michael Cordonnier estimated the 2013 US soybean crop at 3.34 billion bushels with yields coming in at an average 43.5 bu/acre. The USDA say 3.39 billion and 44.5 bu/acre respectively. Despite a bushel/acre lower yield the production estimate was almost identical to the USDA's thanks to an estimated area of 77.87 million acres versus the USDA figure of 77.1 million. Cordonner also forecast the 2013 Brazilian bean crop at 81.5 MMT, and the 2013 Argentine crop at 50.0 MMT, both unchanged from his previous estimates. Brazil’s Trade Ministry said Brazil exported 1.52 MMT of meal in May versus 1.50 MMT in April and 1.35 MMT in May 2012. Jul 13 Soybeans closed at USD15.28 3/4, down 3 3/4 cents; Nov 13 Soybeans closed at USD13.16, down 9 1/2 cents; Jul 13 Soybean Meal closed at USD452.50, down USD1.90; Jul 13 Soybean Oil closed at 48.59, down 7 points. Corn: The weekly crop progress report showed US corn planting advancing from 86% to 91% complete, versus an average trade guess of 92% and 95% a year go. The unplanted area is the equivalent of around 8.75 million acres. Michael Cordonnier said that 1.5-3.0 million acres of corn will remain unseeded, and around half of that will go into soybeans. He estimated the 2013 US corn area at 95.78 million acres versus the USDA estimate of 97.3 million. He estimated this year's US corn yield at 153.0 bu/acre, down from his previous estimate of 155.0 bu/acre and 5 bu/acre lower than the USDA's May forecast. He estimated the 2013 US corn crop at 13.47 billion bushels, still a record but lower than the USDA's suggested 14.1 billion. He also forecast the 2013 Brazilian corn crop at 76.0 MMT, and the 2013 Argentine corn crop at 24.0 MMT, both unchanged from his previous estimates. China’s COFCO bought 60 TMT of Argentine corn for July shipment, the first such purchase since they signed a trade agreement on corn more than a year ago. South Korea bought 50 TMT of South African corn at USD300/tonne C&F for September shipment. Jul 13 Corn closed at USD6.60 1/2, up 4 3/4 cents; Dec 13 Corn closed at USD5.53, down 7 cents. Wheat: The USDA said last night that US spring wheat planting was up just one point from last week to 80% done, and versus the 5-year average of 92%. Winter wheat crop conditions had 32% of the crop rated good/excellent compared to 31% last week and 52% last year. Japan are tendering for 163,605 MT of milling wheat for July/Sept shipment, they are excluding US SRW wheat and say that local millers have sufficient stocks of that to last some time until the GMO problem is resolved. Failing which they will presumably look elsewhere. A Reuters poll put Russian wheat exports in 2013/14 at 16 MMT, some 2 MMT lower than the USDA estimate but 50% up on this season. They also estimated Ukraine's wheat exports at 8.5 MMT (versus 7.0 MMT this season) and Kazakhstan's at 7.5 MMT (vs. 6.5 MMT). Another report on Reuters said that France has received a formal request from Egypt for help with wheat imports. Deferred payment and assistance with grain storage are said to be on the agenda. France are said to be considering the request. Some reports suggest that India's wheat exports could fall to around 1.5-2.0 MMT in 2013/14 as local farmers hold back on sales to the government hoping for higher prices. Jul 13 CBOT Wheat closed at USD7.09, up 1/4 cent; Jul 13 KCBT Wheat closed at USD7.50 3/4, down 3/4 cent; Jul 13 MGEX Wheat closed at USD8.21, down 2 cents. 04/06/13 - EU grains closed mixed with Jul 13 up GBP1.80/tonne at GBP182.00/tonne and Nov 13 down GBP0250/tonne at GBP179.00/tonne. Paris wheat closed with front month Nov 13 EUR0.25/tonne lower at EUR207.50/tonne. The weather situation has improved in eastern Ukraine, southern Russia and western Kazakhstan. MDA CropCast said: "rains should build into southeastern Ukraine and western North Caucasus this week, which will finally begin to ease dryness and crop stress there as well. However, some dryness will likely continue across central Volga Valley." "Russia’s drought-stressed southern wheat may be in for heavy rainfall this week. Locally heavy rains developed Sunday in the Black Earth wheat area of Russia, 1-3 inches in strong thunderstorms. Low pressure may now expand into Southern Russia also. The GFS model sees a chance for 1-1.5 inches of rain this week in the 4 southern wheat districts Stavropol, Krasnodar, Rostov and Volgograd. Sharp cooling is also anticipated as hot 80s F give way to 70s F," said Martell Crop Projections. Latest figures from the Russian Ministry say that spring grain planting as of Jun 3 was 90.6% complete at 27.4 million hectares, with spring wheat 86.3% done on 11.1 million ha, spring barley almost finished at 96.3% on 7.8 million ha and corn plantings exceeding expectations at 105%, sown on 2.3 million ha. The Russian Ag Minister maintained his forecast for a 2013/14 grain crop of 95 MMT, up 32.5% on last year. SovEcon predicted carry-in stocks from this season of 9 MMT, saying that the barley harvest will start in the south within the next few weeks and that the wheat harvest is only now around a month away. IKAR said that domestic new crop Russian 12.5% milling wheat is offered at USD255-257/tonne FOB the Black Sea (circa GBP167.00/tonne), down around USD15/tonne from a week ago, as exporters there sharpen their pencils. The Russian government sold 30,645 MT of intervention grain in a tender today, bringing the total volume sold since sales began in October to 3.39 MMT. The Kazakhstan Ministry meanwhile said that spring plantings there are winding down at 96% complete on 14.52 million hectares. Iran are said to have bought at least 200 TMT of German and/or Black Sea origin wheat, and possibly more. Algeria seek 50 TMT of optional origin milling wheat for August/Sept shipment. The EU Commission lowered their EU soft wheat production estimate by 1.9 MMT from last month to 127.9 MMT. With durum output of a further 8.9 MMT that give is an all wheat crop of 136.8 MMT, almost 2 MMT less than the USDA's 138.7 MMT estimate. However, the Commission also cut their EU animal feed wheat usage by 2.5 MMT, effectively raising ending stocks by 0.6 MMT to 10.3 MMT. In addition they pegged the EU barley crop this year at 56.6 MMT (up 4% on 2012), versus the USDA's 55.3 MMT and the EU corn crop at 66.2 MMT (up 17%) compared with only 63.8 MMT from the USDA. Flooding means that shipping along the middle section of the River Rhine through Germany is likely to remained closed until at least Friday, an official said today. There are also problems on the Elbe and the Danube. June Paris corn expires tomorrow. The BoE's MPC meeting concludes on Thursday, the same day will also bring the June global cereal supply and demand estimates from the FAO and the latest UK cereals usage data from Defra. 04/06/13 -- Rapemeal prices on the continent are mixed, with old crop months sharply higher for a second session in a row, although buyers are few and far between. Possibly this is on the back of German flooding and in anticipation that this year's harvest is going to be later than normal? New crop prices are easier, taking out some of the protection built in yesterday, in line with losses in overnight soymeal values. 03/06/13 -- Soycomplex: Soybeans advanced on US weather concerns and strong global demand, with Jul 13 pressing on to the highest close for a front month since last October and a highest for the contract since September 2012. Fresh news was relatively thin on the ground, ahead of the USDA crop progress report due out after the close. Weekly soybean export inspections of 4.44 million bushels were up on last week's 3.4 million. Strong demand for meal, total US commitments are already 101% of the USDA target for the season, is seen keeping domestic demand for soybeans strong. Brazil's Trade Ministry reported that the country had exported a record 7.95 MMT of soybeans in May, up from 7.15 MMT in April. A Reuters survey estimated US soybean plantings this year at 78.238 million acres versus the USDA's May estimate of 77.1 million as some area gets switched from unplanted corn. The respondents weren't as optimistic as the USDA's 44.5 bu/acre forecast on yields though, coming up with an average estimate of 43.668 bu/acre. After the close the USDA put US soybean planting at 57% complete, up from 44% last week, but well behind the 5-year average of 74% and the slowest pace since 1996. Trade guesses were all over the place, but within a broad range of 50-65% done. The USDA said that 31% of the crop was emerged versus 49% on average. Jul 13 Soybeans closed at USD15.32 1/2, up 22 1/2 cents; Nov 13 Soybeans closed at USD13.25 1/2, up 21 1/4 cents; Jul 13 Soybean Meal closed at USD454.40, up USD7.20; Jul 13 Soybean Oil closed at 48.66, up 28 points. As mentioned previously, beans have found it consistently difficult to hold above the USD15/bu mark since last summer, when fund enthusiasm to be heavily long in the ag sector was far higher than it is currently. It will be interesting to see if they can manage to do so this time. Corn: Overnight support for corn quickly evaporated once the daytime open outcry session opened. Funds are expected to begin rolling out of their July corn longs tomorrow, which may add pressure to the nearby position. Weekly export inspections of 11.660 million bushels were towards the low end of trade expectations. Morgan Stanley forecast US corn plantings at 93.5 million acres, some 3.8 million less than the USDA's May estimate. Even so, the 2013 US crop will still come in at a record 13.3 billion bushels, they said. A Reuters survey came up with and average estimate 95.113 million acres versus the USDA's 97.3 million. Interestingly the same survey estimate the US corn yield at an average of 158.231 bu/acre, from within a range of estimates of 156.0-165.0 bu/acre, and actually slightly higher than the USDA's May estimate of 158.0 bu/acre. After the close the USDA said that corn planting progress had only advanced modestly on the week, up from 86% last week to 91% as of Sunday night, and versus the 5-year average of 95%. North Carolina is the only state seen 100% done. Iowa is a notable laggard at 84% complete versus 99% on average, meaning that 1.7 million acres intended for corn remain unplanted in the state. Nationally the figure is 8.75 million acres versus 4.8 normally. Corn emergence is 74% versus 82% on average. Crop conditions at this early stage are 63% good/excellent versus 72% last year, 67% in 2011 and 76% in 2010. Jul 13 Corn closed at USD6.55 3/4, down 6 1/4 cents; Dec 13 Corn closed at USD5.60, down 7 1/4 cents. An assortment of banks are lining up to predict corn prices in the USD4-5/bu range for the 2013/14 period. Morgan Stanley were fairly optimistic today with an estimate of USD5.30/bu, few see much in the way of upside at the moment, although that could change. US weather developments between now and August will dictate price direction, although you can be sure that things will remain volatile. Wheat: It was a choppy session for wheat. Overnight strength also quickly gave way to weakness, encouraged by sharply lower corn, but wheat managed to turn that around, possibly on the back of unwinding of corn longs/wheat shorts. Weekly export inspections of 16.799 million bushels were down on last week's 21.220 million. Saudi Arabia bought a 525 TMT combo of hard/soft wheat over the weekend for Sep/Oct shipment. US origin wheat was in amongst the options along with Australian, European and South American wheat. 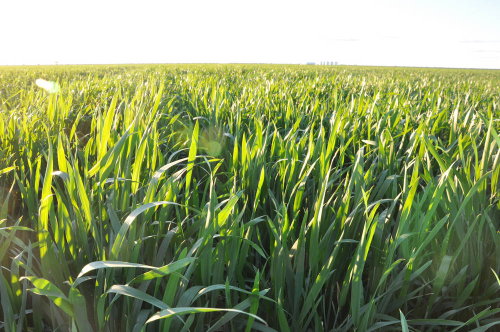 Brazil's Rio Grade do Sul is expecting wheat plantings to rise 4% this year to over 1 million hectares, with production in the state seen rising by almost a third to 2.47 MMT as yields return to more like "normal" levels. Rains have slowed early plantings a little, but should ultimately aid germination, which are only 5% complete versus 8% this time last year. There are reports that the Indian government has been failing to procure as much wheat as it expected following the recent harvest. Whether this is due to farmer dissatisfaction with prices and/or lower production than forecast is unclear. Government agencies in the state of Haryana are said to only have taken 5.88 MMT of new crop wheat into local granaries versus a target of 8.71 MMT and the 8.325 MMT that they had received by this time last year. In Punjab procurement currently stands at 10.9 MMT versus a government target of 14.0 MMT. After the close the USDA said that US spring wheat planting was up just one point from last week to 80% done, and versus the 5-year average of 92%. Emergence is at 61% versus 80% normally. Crop conditions are 64% good/excellent versus 78% this time last year. Winter wheat is 73% headed versus 80% normally, Winter wheat good/excellent conditions rose one percentage point to 32%, but so too did poor/very poor to 43% highlighting the diversity around this year. Jul 13 CBOT Wheat closed at USD7.08 3/4, up 3 1/4 cents; Jul 13 KCBT Wheat closed at USD7.51 1/2, up 1/2 cent; Jul 13 MGEX Wheat closed at USD8.23, up 3 cents. 03/06/13 -- EU grains closed mixed but mostly a little higher on the day following firmer US markets on continued wet weather disrupting US corn, soybean and spring wheat plantings. Jul 13 London wheat finished the day GBP2.30/tonne lower at GBP180.20/tonne, and with Nov 13 ending GBP0.75/tonne firmer at GBP179.25/tonne. Nov 13 Paris wheat settled up EUR1.75/tonne at EUR207.75/tonne. Saudi Arabia bought 410 TMT of hard wheat and 115 TMT of soft wheat over the weekend, both were said to be of optional EU, Australian, and North/South American origin. Much of Europe also had a wet weekend as well as the US, with localised flooding reported in Germany, Austria and the Czech Republic. Wetness in Ukraine though is seen as beneficial though. The Ministry there said that they'd exported 956 TMT of grains in May, including 729 TMT of corn and 156 TMT of wheat. Exports of the latter had ground to a virtual standstill, but are now picking up again thanks to government confidence in a sharp rebound in production in 2013. Grain exports in 2012/13 from Ukraine now amount to 21.86 MMT, of which 12.73 MMT is corn, 6.7 MMT is wheat and 2.1 MMT is barley. Spring plantings meanwhile are complete the Ministry say, including 8.2 million hectares of grains, of which 4.8 million is corn, 2.2 million barley and 1.52 million wheat. Spring grain plantings aren't progressing so well in Russia however where only 26.3 million hectares (86.7% of the planned area) has so far been sown due to dry conditions. That's an area of 1.8 million ha less than this time a year ago. 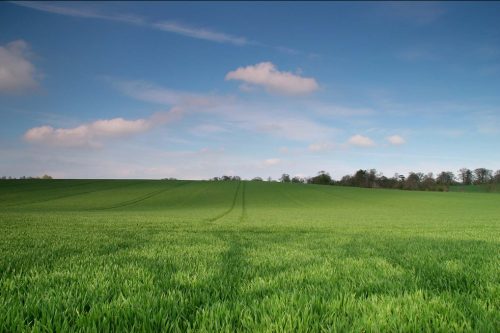 Spring wheat plantings are 10.4 million ha (80.5% of plan), with spring barley at 7.5 million ha (93.6%) and corn at 2.3 million ha (104.9%). 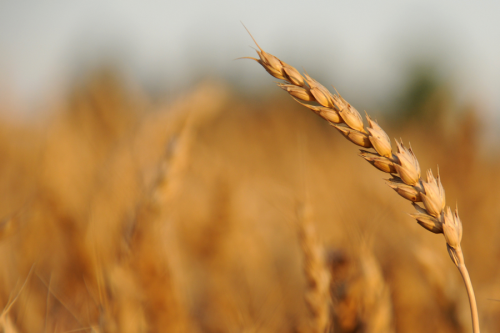 Kazakhstan's May 1 grain stocks stood at 9.3 MMT, say the Ministry. Most of that (8.43 MMT) was wheat. Very beneficial rains fell in eastern Australia over the weekend as Southwestern New South Wales has had its heaviest rain in over a year, bringing relief to farmers there. The US rains that are hampering spring wheat plantings are generally seen being too late to do much good further south for winter wheat in Kansas and Oklahoma. Harvesting is already underway in the southeast with yields reported at average to above average. North Carolina will also get going this week, and early indications out of there also suggest favourable yields. The USDA release planting progress and crop condition ratings after the close this evening. Spring wheat was 79% planted a week ago and winter wheat good/excellent was 31%. 03/06/13 -- Rapemeal prices on the continent are sharply higher today, in line with strong gains in CBOT soymeal on Friday night which have followed through into morning trade. A wet weekend on the continent may have caused some crop damage, with localised flooding being reported in the south of Germany.